Google’s Play Store announced the best apps and games of the year in several categories such as the most entertaining apps, best-hidden gems, competitive games, best self-improvement games and more. Besides this, it came up with the Fan Favorite category for the first time and several popular apps were rated by the users. Likewise, when it comes to dictionary and learning apps, U-Dictionary has got the acclaim in 2018. 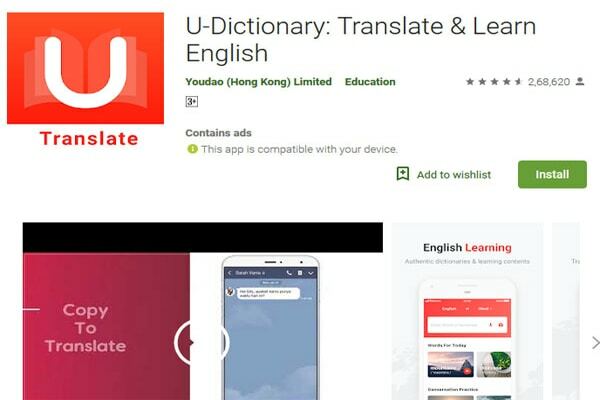 When it comes to the Indian version of the app, U-Dictionary aims to bridge the gap that exists between English and the country’s regional languages. You can view the meanings of any English word in more than 43 languages such as Hindi, Tamil, Telugu, Kannada, Malayalam, Bangla, Gujarati, Punjabi, Marathi, Urdu, Nepali, Assamese, etc. But this is something that we see in many other dictionary apps. So, what’s unique about the U-Dictionary app? Well, Quick Translate, Copy to Translate, Lock Screen Vocabulary, Word Games, and Offline accessibility are some features that make it stand out among the competition. U-Dictionary’s Copy to Translate feature lets you copy any word as you browse or chat. If you are reading any piece of content and you need a quick translation, you just have to copy the specific word and the app icon will appear. Once you hit the icon, you can view the meaning of the word in the preferred language. Interestingly, all this happens without launching the U-Dictionary app and leaving the task that you are doing. So, you get a flawless experience without any switching between the apps. Besides the translation of any word that you come across as you browse or chat, the U-Dictionary app lets you get translations of text right from the camera app. Well, you can focus on the text that you see and get the meaning right on your smartphone’s screen. Notably, this feature can recognize 12 languages. Every day, you can learn new word definitions to enhance your vocabulary skills with the U-Dictionary app. Well, this is possible with the app’s lock screen vocabulary feature. It shows the word definitions right on the lock screen of your smartphone so that you learn and strengthen your vocabulary without unlocking your phone.